My hand-crafted lamps, chandeliers and some of the wind chimes are made using "up-cycled" bicycle wheels, and other items not normally associated with wind chimes. This is what sets them apart and makes them so unique and truly one-of-a-kind. 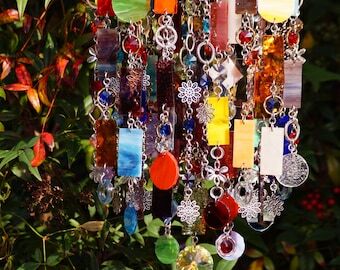 Because my wind chimes are hand-crafted, you might see slight "imperfections" in the glass pieces. I use as few tools as possible and appreciate minor "flaws" and "imperfections". These character "flaws" only add to the uniqueness of the piece. My creations are meant to be both seen and heard throughout the entire year. 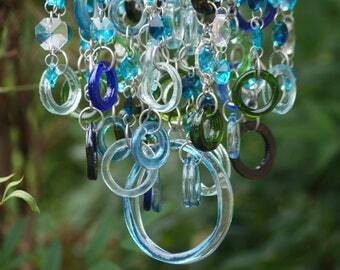 Because they are glass it is a good idea to hang them in an environment free of harsh weather. A picture window, sun porch, or lanai, would be perfect. I adore custom orders. Feel free to contact me with any questions or ideas you might have. Layaway is available. A non-refundable deposit is required up front. Unless otherwise noted balance for layaway is due within 6 weeks. Custom items are always appreciated and encouraged. Because it is a custom item a 50% NON-refundable deposit is required before work can begin. Payment is paid in full upon completion of project. International orders are always welcomed and encouraged. International shipping is both expensive and often varies greatly from country to country. If you do not see a shipping rate for your country feel free to contact me to discuss current rates. My latest addition beyond beautiful!! Proud owner of three! Seller is easy to work with and packages beautifully. Smooth transaction from start to finish! A creative soul who expresses herself using glass and fragrance blends. I have always loved art and making "things". I see inspiration everywhere and love being creatively busy. One might say glass found me. I was looking for new candle packaging when Fate stepped in, distracted me, and instead of candle packaging I bought sheets of stained glass. The rest, as they say. I am completely self-taught and love that each day brings a new experience. Once I get an idea in my head I have to see it through because it sort of take over and becomes difficult for me to do anything else. Some dream in chocolate I dream in stained glass and fragrance blends. Welcome and thanks so much for stopping by Anhoki's Place. My love for color, textures, and fragrance has spilled over to what you see in this shop. A great deal of blood, sweat, and coffee goes into each of the items you see here. The glass items were all hand cut, drilled, ground and assembled by yours truly. I take pride in the unique scent blends I offer you and do my best to keep them as unique as possible. If you have ideas for a glass piece feel free to drop me a line and express yourself. I love reading others' thoughts and ideas. >> I do apologize but sending the item back for repair is not possible. If one or two pieces of glass arrive damaged I will be happy to send replacement pieces to you for free. Please provide a photo showing what is broken in your message. 2) I'm sorry, but I WILL NOT provide refunds if you don't like the item. Unless otherwise arranged full payment is required up front. If you need to "layaway", unless otherwise arranged, 50% of the items value is required up front. When making payments I normally add the entire shipping amount to the value of the item and then divide the total by the amount of payments the buyer and I have agreed to. If you find you can not follow through with your payment plan any and all payments ALREADY made can NOT be refunded. 1) We do our best to keep pricing reasonable. Our main shipping carrier is USPS. ALL glass items ship via PRIORITY MAIL with delivery confirmation and insurance for the amount the item was purchased for. We now ship WORLDWIDE. IF you feel the shipping price to your country is too high feel free to contact me and I will check it for you. 2) Once a package has left my hands it is out of my control. If your item is received damaged or never arrives you will need to file a claim for the insurance money and then contact me if you wish to work together on obtaining a new piece. 3) We will send you confirmation of order shipment via Etsy convo ONLY. 4) Unless otherwise expressed NON CUSTOM orders should ship within 5 to 7 business days if not sooner. Business days do not include weekends and holidays. This is for READY TO SHIP items only. 5) If you have purchased something that is MADE TO ORDER your order will be delayed and not ship within the 5-7 day window of ready to ship items. Custom orders will obviously take longer. Production and shipping times for custom items is case by case. WE NO LONGER OFFER STANDARD & CUSTOM SOAP STAMPS OR SOAP MOLDS AND CUTTERS. >>I DO APOLOGIZE BUT WE DO NOT OFFER WHOLESALE PRICING OR CONSIGNMENT FOR OUR PRODUCTS. 1.1 Anhoki's Place is a small business that sells on Etsy as anhoki.etsy.com, Facebook facebook.com/anhoki, Instagram @anhoki. 1.2 We are committed to safeguarding the privacy of our anhoki.etsy.com and anhoki.com visitors and service users. 1.3 This policy applies where we are acting as a data controller with respect to the personal data of our various anhoki.com and anhoki.etsy.com visitors and service users; in other words, where we determine the purposes and means of the processing of that personal data. 1.5 In this policy, "we", "us" and "our" refer to Anhoki aka Anhoki's Place aka anhoki.com and anhoki.etsy.com. For more information about us, see Section 13. 2.2 We may process data about your use of our various Anhoki's Place sites and services ("usage data"). The usage data may include your IP address, geographical location, browser type and version, operating system, referral source, length of visit, page views and website navigation paths, as well as information about the timing, frequency and pattern of your service use. The source of the usage data is Google Analytics Solutions. This usage data may be processed for the purposes of analyzing the use of the various Anhoki's Place and services. The legal basis for this processing is our legitimate interests, namely monitoring and improving our various Anhoki's Place stores and services. 2.3 We may process your account and order/contractual data ("account data"). The account data may include your name, address and email address. The source of the account data is you. The account data may be processed for the purposes of operating/maintaining our various Anhoki's Place stores, providing our services, ensuring the security of our various Anhoki's Place stores sites and services, maintaining back-ups of our databases and communicating with you. The legal basis for this processing is consent, or our legitimate interests, namely the proper administration of our various Anhoki's Place and business or the performance of a contract between you and us and/or taking steps, at your request, to enter into such a contract. 2.4 We may process your information included in your personal profile on our various Anhoki's Place ("profile data"). The profile data may include your name, address, telephone number and email address.The profile data may be processed for the purposes of enabling and monitoring your use of our various Anhoki's Place sites and services. The legal basis for this processing is consent, or our legitimate interests, namely the proper administration of our website and business or the performance of a contract between you and us and/or taking steps, at you request, to enter into such a contract. 2.5 We may process your personal data that are provided in the course of the use of our services ("service data"). The service data may include your name, address, telephone number and email address. The source of the service data is you. The service data may be processed for the purposes of operating our various Anhoki's Place stores, providing our services, ensuring the security of our various Anhoki's Place stores and services, maintaining back-ups of our databases and communicating with you. The legal basis for this processing is consent, or our legitimate interests, namely the proper administration of our various Anhoki's Place stores and business or the performance of a contract between you and us and/or taking steps, at your request, to enter into such a contract. 2.6 We may process information or photographs that you post for publication on our various Anhoki's Place sites stores or through our services ("publication data"). The publication data may be processed for the purposes of enabling such publication and administering our various Anhoki's Place stores and services. The legal basis for this processing is consent, or our legitimate interests, namely the proper administration of our various Anhoki's Place stores and business or the performance of a contract between you and us and/or taking steps, at your request, to enter into such a contract. Any photographs that you provide of your personal collection of Anhoki's Place items and or testimonials of your experience with Anhoki's Place sites and stores will be used in our various Anhoki's Place stores listings, and for promotional purposes only. 2.7 We may process information contained in any enquiry you submit to us regarding goods and/or services ("enquiry data"). The enquiry data may be processed for the purposes of offering, marketing and selling relevant goods and/or services to you. The legal basis for this processing is consent, or your legitimate interests, namely your request for goods or service information and communication, and our legitimate interests, namely our interests in the proper administration of our various Anhoki's Place stores and business, and for marketing and selling relevant goods . 2.9 We may process information relating to transactions, including purchases of goods and services, that you enter into with us and/or through our various Anhoki's Place stores ("transaction data"). The transaction data may include your contact details, and the transaction details. The transaction data may be processed for the purpose of supplying the purchased goods and services and keeping proper records of those transactions. The legal basis for this processing is the performance of a contract between you and us and/or taking steps, at your request, to enter into such a contract and our legitimate interests, namely the proper administration of our various Anhoki's Place stores and business. 2.11 We may process information contained in or relating to any communication that you send to us ("correspondence data"). The correspondence data may include the communication content and metadata associated with the communication. Our various Anhoki's Place stores will generate the metadata associated with communications made using the various Anhoki's Place stores and sites contact forms. The correspondence data may be processed for the purposes of communicating with you and record-keeping. The legal basis for this processing is our legitimate interests, namely the proper administration of our various Anhoki's Place stores and business and communications with users. 3.3 We may disclose personal data, namely your name, address, telephone number or email address to our suppliers or subcontractors insofar as reasonably necessary for filling the contract and for the proper administration of our various Anhoki's Place stores and business. the period of retention of personal data will be determined based on proper administration of our various Anhoki's Place stores and business requirements. 5.6 Notwithstanding the other provisions of this Section 6, we may retain your personal data where such retention is necessary for compliance with a legal obligation to which we are subject, or in order to protect your vital interests or the vital interests of another natural person. 6.3 We may notify you of to this policy by email or through the private messaging system on our various Anhoki's Place sites and stores. 11.3 If you block cookies, you will not be able to use all the features on anhoki.com and its affiliated Anhoki's Place stores. 12.1 This website is owned and operated by Angela Kicklighter, founder of Anhoki's Place. 13.1 Our data protection officer's contact details is: Angela Kiclighter at the above address. All Policies subject to change. And if all the information and details become too burdensome I may hault EU sales permanently. I'm shocked you've made it this far but thanks for doing so and understanding.